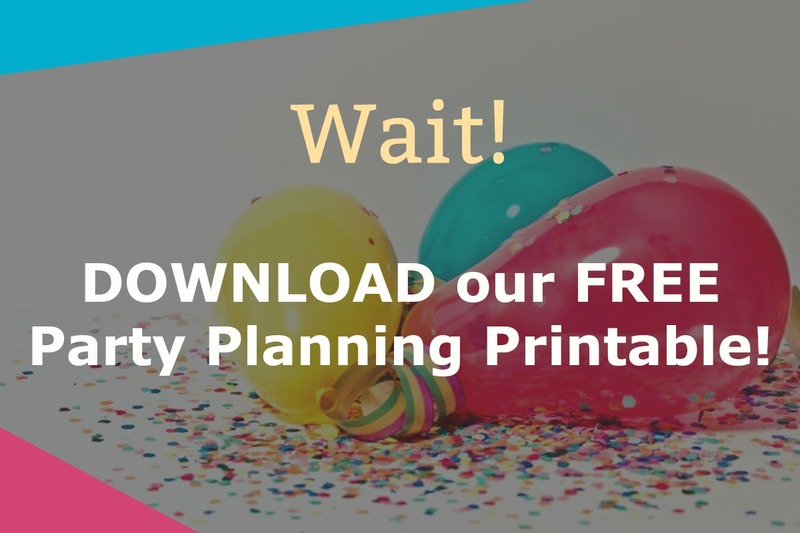 If you are planning a party for your commencement, you need graduation party games! Kick it up a notch with these 7 fun games! Don’t miss out this opportunity: 10% off Graduation Items on Orders $65+ with code: GRAD10AF. Offer excludes clearance items. Sure, you can sit around and talk and take selfies and eat good food, but you want this to be a memorable party right? 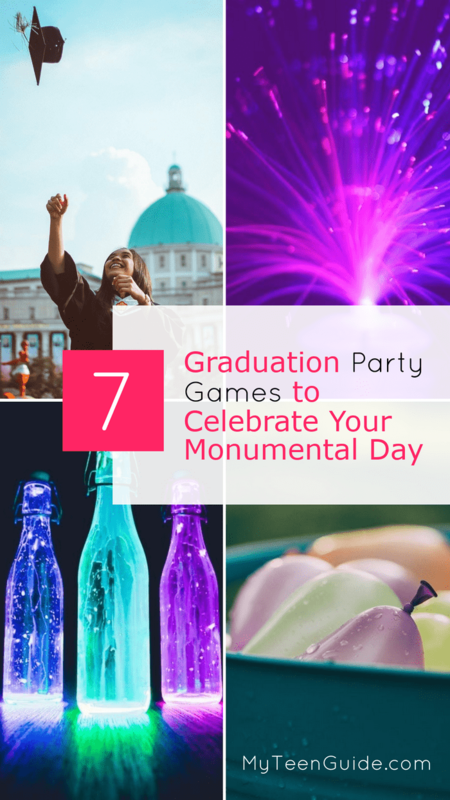 So let the games begin with these fun 7 graduation party games! This game is so fun! You probably have some of these things around the house too. The sticks fit nicely into the bottles and you can use the bracelet or necklace ones to fit inside the ball. Set them up and be sure to keep score! Setting up a game of backyard twister is super simple. You can either make a game board or just paint on the grass. Take a piece of cardboard , or an empty box and cut a big hole out (this will be making your colored circles). Then head to the hardware store (or your garage) and grab some red, yellow, blue and green spray paint . Instead of a spinner, you can write on pieces of paper and pull them from a bowl. This is another fun game to play in the dark! Buy a few packages of glow necklaces (seriously, stock up because you can use them for so many things) to use for the rings. Divide them by color so each friend can have their own color. Trust me, this makes it so much easier to keep score! For the dowel, you can either buy one from the hardware store or just use a stick from your backyard. Check out this tutorial for how to make your glow stick ring toss game! This is one of the few graduation party games that takes quite a bit of planning in advance, but it’s so worth it! There are two fun variations that you can try. The first one is perfect if your graduation party is just for family and close friends. The second is perfect for those huge parties that include a lot of people from your graduating class. All about you: Print out a bunch of pictures of yourself over the years (you have to know the year it was taken, and write it on the back). You can have post-its available for your guests, and they have to guess the year the pic was taken. A small prize for the winner is fun! Plus this game allows everyone to ‘ooh’ and ‘ahhhh’ at how cute you were! Fun for all: Same concept, but print out pictures of your friends from throughout your high school years. Get their permission to borrow them from Facebook or Instagram, or use your own pictures that you’ve taken over the years. I wish I had done this, it’s one of the coolest graduation party games! When your guests arrive, they each get a sticky note attached to their back, with the name of a teacher on it. Your guests can only ask yes or no questions to figure out which teacher they are! Obviously, this game works best if you’re including people from your graduating class. If it’s a family and friends affair, then you can do famous people, names of family members, and such. Giant Jenga is probably one of the most popular backyard games, and for a good reason. It’s hilariously fun! You have two options for your Jenga blocks: make your own or buy them. Amazon sells a set of giant Jenga blocks , but they are a little on the expensive side. Making your own DIY Jenga game is a lot cheaper and easier. You can buy the materials for under $25. You can also use foam blocks if you’re worried about being buried beneath an avalanche of wooden blocks! You may want to tell your guests ahead of time they will get wet (just so they don’t wear their cutest dress they don’t want to get wet). You just need a big bucket, and water balloons . It is like dodgeball but with water balloons! Just in case you haven’t played this in awhile, here is a refresher. One person is ‘it’ and has the water balloons, trying to hit the other players. Once a player is hit, that person is ‘it’ and tries to hit other players. No matter what games you play at your graduation party, you are no doubt going to be making some memories. It is a bittersweet time of year, you are excited and happy to be moving on, but you are also sad to be moving on and leaving friends behind. So be sure to take lots of pics and selfies! Do you have any other fun games to play at your graduation party? Share with us below! We like fun games!